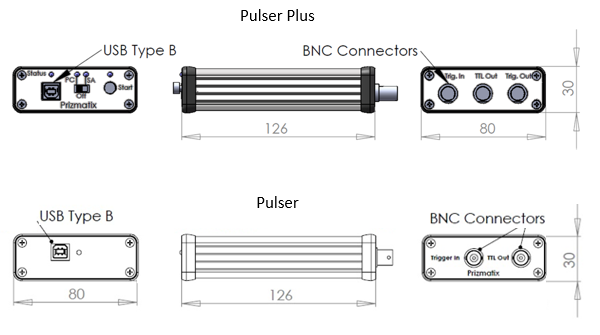 The Pulser is a programmable TTL pulse train generator for pulsing LEDs, lasers and shutters used in Optogenetics activation in neurophysiology and behavioral research. The Pulser device comes with user friendly Windows® software that enables easy visual setup of numerous pulse train configurations. The Pulser TTL-Out output can work smoothly to trigger Prizmatix LED light sources or lasers to produce light pulses for opsin activation. 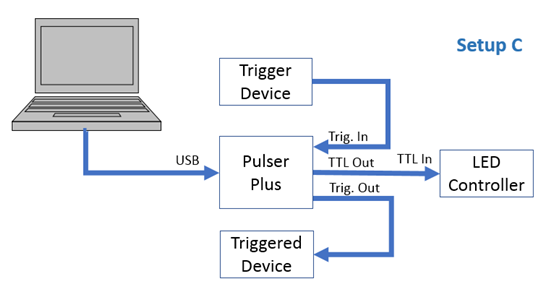 The Trigger-Out output (PulserPlus only) enables further activation of additional devices after pulse train was completed. 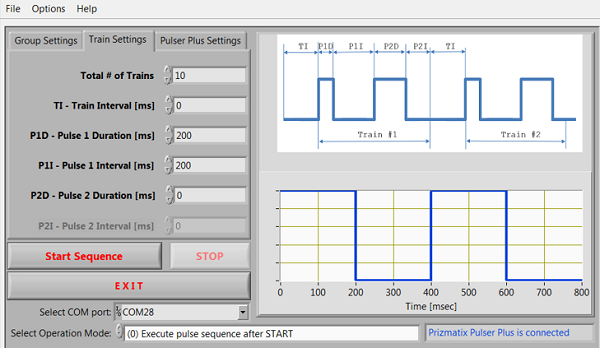 Trigger-Out output (PulserPlus only) enables activation of other devices after completion of pulse train sequence. Pulser settings can be stored into a file to enable fast switch between various protocols. Log-File can be created to record experiment activities. Easy control from LabVIEW, MATLAB or any HyperTerminal-like software capable of sending and receiving simple ASCII commands over serial COM port (API provided). (A) PC Control with direct connection to LED. (B) PC Control with external trigger device. 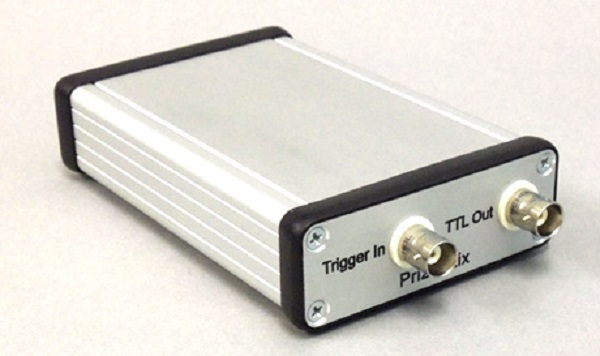 (C) PC Control with trigger in and trigger out to send pulses to additional triggered device. (D) SA -Stand Alone mode, triggered or manually activated, no PC needed during operation. The software enables easy visual design of the various pulse conditions. The pictures below show the Graphical User Interface (GUI). The upper right side of the GUI shows an example waveform with the legend of user definable parameters. The bottom pane shows the actual TTL waveform programmed with the user settings on the left side. 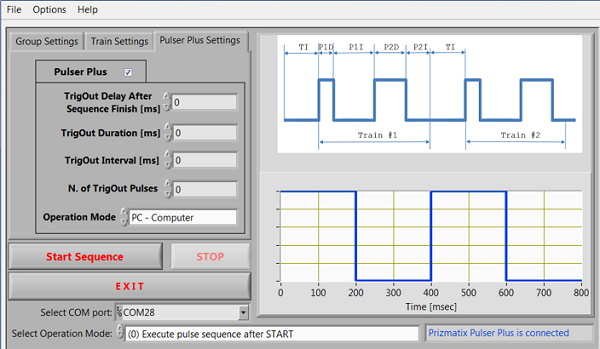 The Train Settings tab allows setting of single or bi-phasic pulse timing and pulse repetition creating multiple pulse trains. The Group Settings tab allows creation of multiple Groups of Trains, comprising the sequence. The TrigIn parameter defines the number of triggers needed to start sequence if appropriate Operation Mode is chosen. The PulserPlus is an enhanced TTL pulser that adds stand-alone operation and TTL Trigger-Out. 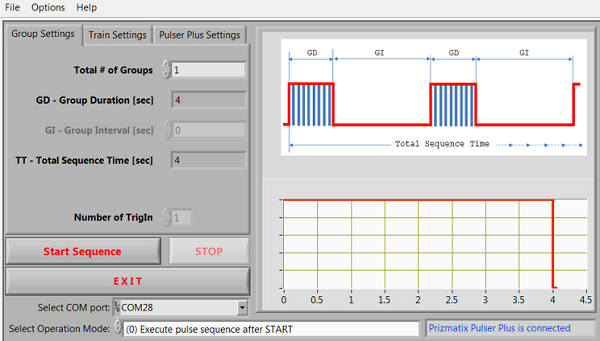 The PulserPlus tab in GUI allows the user to define all the trigger-out parameters as well as switch between Stand-Alone programming mode and PC Run mode. The Operation mode selector at the bottom of GUI provides four operation modes (see key features above). The Operation mode selector at the bottom of GUI provides four operation modes (see key features above). 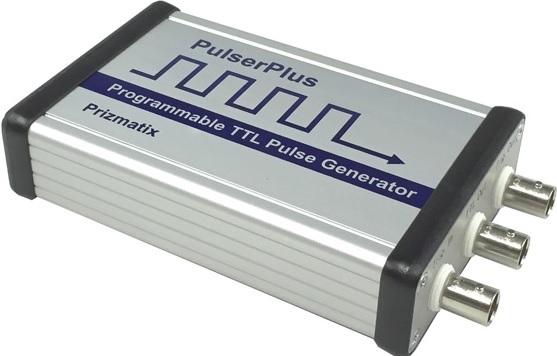 Programmable TTL pulse train generator for use with Optogenetics-LED or other light sources.